While assuring that the Board would continue to identify with all efforts to find lasting solution to the problem, the members stated that they were aware of the problem being experienced by the Terminal Operators, Port users and the general public as a result of the traffic gridlock. 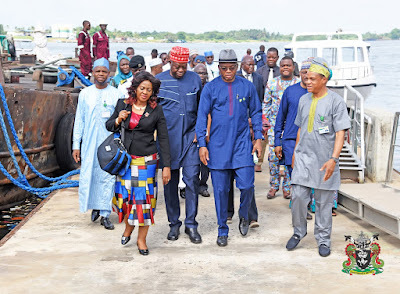 The Chairman of the Board, Chief Emmanuel Olajide Adesoye, spoke on behalf of other members of the Board at the end of their tour of the terminals within the western axis, consisting of Lagos Port Complex (LPC) and Tin-can Island Port on Friday, 12th April 2019. According to the Board Chairman, the Management is very much aware of the challenges faced by Terminal Operators and Port users in assessing the Port due to the gridlock. He assured that the NPA was working in synergy with other government agencies such as the Federal Ministry of Power, Work and Housing (FMWH) in cushioning the pressure on the roads leading to the Port, with the rejuvenation of rail lines in the Port, the call- up system as well as expanding the Port access roads. He reaffirmed that ‘’the Board is conscious that Badges are currently being used to transfer cargoes from Tincan and Apapa Ports to Ikorodu and Kirikiri Lighter Terminals." That, according to him, has drastically reduced the clog on the wheel of progress on the lane to greater service delivery at the Nation’s seaports. The NPA Board Chairman stated that on completion, the Lekki Deep Sea Port which is a product of Private Public Partnership and great collaboration would help in the efficient movement of Cargo and expressed the strong hope that the Port would be a reference point within the Gulf of Guinea. Chief Adesoye has reiterated the commitment of the Board and Management of the Authority to provide modern Port infrastructure in all seaports in the country, in order to encourage sufficiency in the system. Earlier, the Port Manager Tincan Island Port Complex (TCIP) Engineer Emmanuel Akporherhe, while welcoming the Board members to the Port solicited for the renewal of the infrastructure round the Port in other to facilitate greater customer satisfaction, saying that some of the existing infrastructure in the Port are over (40) forty years old. The Port, according to him within the First Quarter of 2019 berthed a total of Two Hundred and Thirteen (213) ships with a tonnage of Six Million Seven Hundred and Seventy-Eight Thousand Three Hundred of Ninety-Seven (6,778,397) with a Cargo throughput of Four Million Seven Hundred and Ninety Thousand Two Hundred and Eighty-Two (4, 790, 282) which was an improvement of 2018. The Port Manager, LPC Hajia Aishat Ibrahim in her brief to the Board members informed them of the activities of the Port and the feats it had attained in its operation.